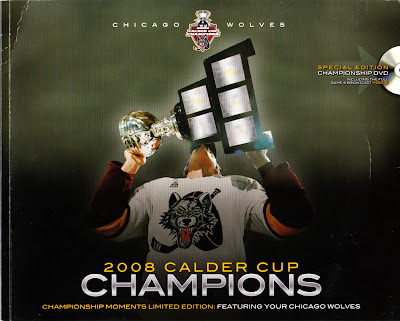 Being a huge Chicago Wolves fan, I was thrilled when they won the 2008 AHL Calder Cup. The next season, the Wolves started selling the 2008 Champions DVD & Photo Book on their web site for $29.95. Ever since then, I have had the page on their online store bookmarked knowing that at some point I would be adding it to my collection. Recently, I saw that they had reduced the price to just $15. I quickly placed my order. The package contains a 36 page soft cover book featuring photos from the championship winning game and 2 DVDs. The first with the complete final game, and the second disc filled with bonus materials. I have already sat and watched the full game, and look forward the bonus disc when I get the chance. If you have never seen a Wolves home game, you are missing something special. They have by far the best pre-game show of any team I have ever seen... and I have seen a ton of games (my minor league hockey game collection is well over 2500 games). If you are interested in seeing their pre-game, there are all kinds of clips on Youtube. 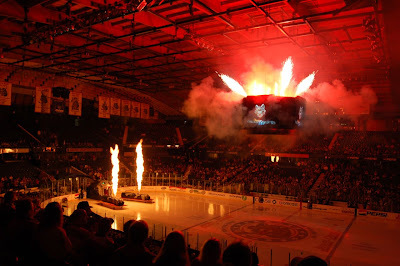 Just search for Chicago Wolves intro and you will find a bunch to choose from. And check out the amazing photos on Wobbly85's Flickr photostream.